This entry was posted in Breakfast Foods, Cakes, Coffee Cakes, Desserts, Fruit, recipes. Bookmark the permalink. MMMMM! I’m getting some my blueberries out of the freezer as soon as I have a day off that’s cool. Probably won’t be til December. I finally turned the oven on today for the first time in a month. It is still scorching hot but sometimes you just have to have something sweet and tasty like this. 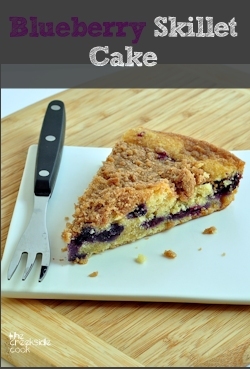 that looks so moist and tasty – I’m bookmarking to give it a try! Thanks so much Lana – it’s a pretty smiley thing! Hope you do Misa – let me know how it turns out for you, ok? Not much makes me more happier than a moist, fruity cake as well! This looks delicious, I love skillet cakes. They are so much fun to make! This is making me very, very hungry, haha! :) Thanks for the inspiration! Blueberries and crisp topping…you sure know how to pamper yourself! This looks irresistible! You’re welcome Laura and thanks for the kind comments! Perfect summer dessert. I have blueberries in my fridge ready to go and Vanilla Bean Ice Cream in the freezer…..yummy:) Thank you for sharing! You really know how to wreck a guy’s diet yanno? Seriously – it looks really good. Thanks Bibi – I hope that you give it a try. Bobby – go for a nice long walk after! Except for the blueberry part, this looks amazing. :) I need to figure out more ways to use my cast iron. It’s getting so I don’t like to bake in anything but cast iron. Flea – this would be good with just about any kind of fruit, though for bigger fruits, you would want to pre-cook it a bit somehow or other, probably. Cast iron is so great for baking! Chrissy, I think raspberries would be delicious in this. The only change I would make would be to fold the berries in by hand. They are more fragile than blueberries, so I would not want to mash them up so much. I hope you try it & come back to say how it worked for you! wow, another great looking recipe from you!